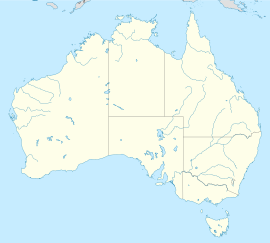 For other uses, see Kalgoorlie (disambiguation). Kalgoorlie-Boulder, known colloquially as just Kalgoorlie, is a city in the Goldfields-Esperance region of Western Australia, located 595 km (370 mi) east-northeast of Perth at the end of the Great Eastern Highway. 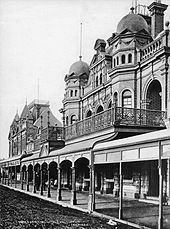 The city was founded in 1889 by the amalgamation of the towns of Kalgoorlie and Boulder, which developed in 1893 during the Coolgardie gold rush, on Western Australia's "Golden Mile". It is also the ultimate destination of the Goldfields Water Supply Scheme and the Golden Pipeline Heritage Trail. At June 2015, Kalgoorlie-Boulder had an estimated urban population of 32,797. The name Kalgoorlie is derived from the Wangai word Karlkurla or Kulgooluh, meaning "place of the silky pears". Since 1897, a tree has marked the spot where gold was found on 14 June 1893. In the winter of 1893, prospectors Patrick (Paddy) Hannan, Tom Flanagan, and Dan Shea were travelling to Mount Youle when one of their horses cast a shoe. During the halt in their journey, the men noticed signs of gold in the area around the foot of what is now the Mount Charlotte gold mine, located on a small hill north of the current city, and decided to stay and investigate. 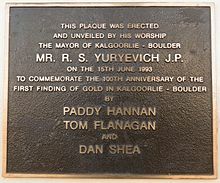 On 17 June 1893, Hannan filed a Reward Claim, leading to hundreds of men swarming to the area in search of gold, and Kalgoorlie, originally called Hannan's Find, was born. Hannan Street in September 1930: The Exchange Hotel is at the centre, with the Palace Hotel on the right. The population of the town was 2,018 (1,516 males and 502 females) in 1898. The mining of gold, along with other metals such as nickel, has been a major industry in Kalgoorlie ever since, and today employs about one-quarter of Kalgoorlie's workforce and generates a significant proportion of its income. The concentrated area of large gold mines surrounding the original Hannan's find is often referred to as the Golden Mile, and was sometimes referred to as the world's richest square mile of earth. In 1901, the population of Kalgoorlie was 4,793 (3,087 males and 1,706 females) which increased to 6,790 (3,904 males and 2,886 females) by 1903. The 3 ft 6 in (1,067 mm) narrow-gauge Government Eastern Goldfields Railway line reached Kalgoorlie station in 1896, and the main named railway service from Perth was the overnight sleeper train The Westland, which ran until the 1970s. In 1917, a 4 ft 8 1⁄2 in (1,435 mm) standard gauge railway line was completed, connecting Kalgoorlie to Port Augusta, South Australia, across 2,000 kilometres (1,243 mi) of desert, and consequently the rest of the eastern states. The standardisation of the railway connecting Perth (which changed route from the narrow-gauge route) in 1968 completed the Sydney–Perth railway, making rail travel from Perth to Sydney possible; the Indian Pacific rail service commenced soon after. During the 1890s, the Goldfields area boomed as a whole, with an area population exceeding 200,000, composed mainly of prospectors. The area gained a notorious reputation for being a "wild west" with bandits and prostitutes. This rapid increase in population and claims of neglect by the state government in Perth led to the proposition of the new state of Auralia, but with the sudden diaspora after the Gold Rush, these plans fell through. 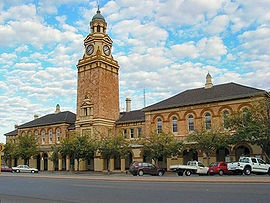 Places, famous or infamous, for which Kalgoorlie is noted include its water pipeline, designed by C. Y. O'Connor and bringing in fresh water from Mundaring Weir near Perth, its Hay Street brothels, its two-up school, the goldfields railway loopline, the Kalgoorlie Town Hall, the Paddy Hannan statue/drinking fountain, the Super Pit, and Mount Charlotte lookout. Its main street is Hannan Street, named after the town's founder. One of the infamous brothels also serves as a museum and is a major national attraction. Kalgoorlie and the surrounding district were served by an extensive collection of suburban railways and tramways, providing for both passenger and freight traffic. In 1989, the Town of Kalgoorlie and Shire of Boulder formally amalgamated to create the City of Kalgoorlie-Boulder, adjoining the two towns into what is now the Fifth most populous city in Western Australia. On 20 April 2010, Kalgoorlie was shaken by a an earthquake that reached 5.0 on the Richter scale. The epicentre was 30 km north east of the town. The quake caused damage to a number of commercial hotels and historic buildings along Burt Street in Boulder. The entire Burt St. precinct was evacuated until 23 April. Work in the Superpit and many other mines around Kalgoorlie was stopped. Two people suffered minor injuries as a result of the quake. On 29 August 2016, Kalgoorlie was the scene of a collision between a 56-year-old non-Indigenous man and 14-year-old Indigenous teenager Elijah Doughty. The 56-year old believed Doughty had stolen his motorbike and chased him in his utility. The utility struck Doughty who died of fatal injuries. There was no evidence that Doughty had stolen the motorcycle. The following day, a protest over Elijah's killing was held. Several police officers were injured during the riot and at least 10 people were charged. In July 2017, the 56-year old Kalgoorlie man who admitted causing the death of the Indigenous teenager was found not guilty of manslaughter, but sentenced in a Perth Court to three years in jail after being convicted of causing death by dangerous driving. Kalgoorlie–Boulder is a regional centre and has a Chamber of Commerce and a Chamber of Minerals and Energy. Since 1992, Kalgoorlie has been home to the Diggers & Dealers conference, held annually in August. It is Australia's premier international mining conference. It is also home to the Australian Prospectors & Miners' Hall of Fame. The Super Pit is an open-cut gold mine about 3.6 km (2.2 mi) long, 1.6 km (1.0 mi) wide, and 512 m (1,680 ft) deep. It was created by Alan Bond, who bought up a number of old mining leases to get the land area needed for the Super Pit. Occasionally, the excavating has revealed an old shaft containing abandoned equipment and vehicles from the earlier mines. A visitor centre overlooks the mine which operates 24 hours a day, 7 days a week. The mine blasts at 1:00 pm every day, unless winds would carry dust over the town. Each of the massive trucks carries 225 tonnes of rock and the round trip takes about 35 minutes, most of that time being the slow uphill haul. Employees must live in Kalgoorlie; it is not a fly-in, fly-out operation. The mine is expected to be productive until about 2029. The Super Pit that gives the mine its name appears in the centre of this image. Kalgoorlie–Boulder has a dynamic and diverse cultural scene. Kalgoorlie–Boulder has many arts organisations and practising artists. Kalgoorlie–Boulder's location, being roughly 600 km from Perth, enjoys high levels of participation in Australian rules football, netball, basketball, rugby league, soccer, field hockey, and cricket. Other popular sports in Kalgoorlie include tennis, lawn bowls, roller derby, rugby union, and swimming. Soccer is popular with the Goldfields Soccer Association running the sport in the Kalgoorlie-Boulder region. Kalgoorlie also has an international squash tournament held every year at the YMCA. In a statewide sense, the semiprofessional Goldfields Giants basketball team competes in the State Basketball League, and were league champions in 2007 and 2008. The Goldfields Titans play in the Western Australia Rugby League Harvey Norman Premiership state rugby league competition. Home games are at the Oasis playing fields on Saturday afternoons. Horse racing is also very popular in the city, and Kalgoorlie–Boulder is home to the internationally recognised annual "Race Round". Given the wealth of its yesteryear, Kalgoorlie features many elaborate heritage buildings that have been retained. 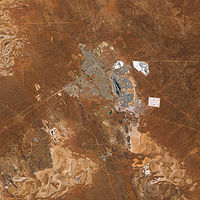 Kalgoorlie–Boulder – the largest settlement for many hundreds of kilometres, with many employees at the Super Pit – is the centre of the area's social life. 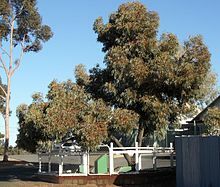 Of particular interest is the Kalgoorlie–Boulder Racecourse, a horse racing venue. Also well known in the area are the Kalgoorlie Skimpies, ladies employed by each pub who walk around in their underwear or burlesque outfits to attract punters and who expect a fee in return. Two grass sports ovals and a cinema showing recent international releases are in the area. Known as the home of the Super Pit, it is one of Kalgoorlie–Boulder's historical suburbs featuring many buildings and landmarks dating as far back as 1882. It was once the central business district for the Town of Boulder, but since amalgamation with Kalgoorlie, it is now more of a historical local centre. Boulder has its own post office, town hall and many hotels along its main thoroughfare, Burt Street. A significant refurbishment has been commenced as part of the 'Royalties for Regions' initiative. A new housing suburb located next to the Kalgoorlie-Boulder Airport, which was recently expanded. This area derives its name from the golf course that once occupied the area. It was released to provide affordable property to a growing population in Kalgoorlie–Boulder. Fairways features a private primary school, church, caravan park and small business. Adeline was originally constructed around 1970 by the State Housing Commission. The suburb was built on the "Radburn concept", with houses facing away from the street and common pathways linking homes. The area has been plagued by antisocial problems. In 2003, a significant urban renewal project, including the renaming of the suburb to Golden Grove and re-aligning of homes was commenced. The project has seen some success but has yet to fully eliminate antisocial problems within the area. Located in Kalgoorlie's far north. Hannans was the first suburb to have its own independent shopping centre ("Hannans Boulevard") which includes a Coles Supermarket. The area also has a primary school and an 18-hole golf course. The original course was not formally grassed but was recently refurbished. Several surrounding golf clubs joined together to form one club known as 'The Goldfields Golf Club'. A dam has been constructed to service what is now a luxury desert golf course and club. Alongside the golf course project has been the development and release of Greenview estate. It lies on the western border of Hannans. This ongoing project has been designed as an environmentally friendly estate, and will eventually consist of over 2000 homes, apartments and facilities such as parks and schools. As one of Kalgoorlie's highest growth areas there has been a proposal for a new alternative route, out of the suburb onto the Kalgoorlie Bypass, to avoid traffic problems on the already heavily used Graeme Street which is a direct route to the city centre. Other developments include 'Karkurla Rise' and 'Karkurla View' which have added an additional 400 homes to the area. The central business district. Hannan Street, named after Paddy Hannan, is Kalgoorlie's main street and stretches The length of the suburb. The western side of the suburb consists of housing and some light industry. The eastern side contains retail chains, banks, the police station, court house, restaurants, hotels, tourist attractions, schools, university and TAFE. One of Kalgoorlie's oldest suburbs. Much like other older suburbs, almost every street is parallel with Hannan Street in Central Kalgoorlie. Streets are noticeably wide. It houses North Kalgoorlie Primary School, small businesses, a medical practice, a hotel, tavern and a non-maintained 18-hole golf course. Much smaller today than it originally was before the Super Pit expansion. It's located at the far east end of Lamington between the northern Goldfields railway and Goldfields Highway. Officially O'Connor is the south-east section of the suburb of Somerville. Much of the area is increasingly now known as O'Connor. It is home to a primary school, private high school Goldfields Baptist College and shopping facilities. It also houses the city's only recreation centre. A narrow suburb following Piccadilly street between Central Kalgoorlie and Lamington. It features the city's regional hospital, small businesses, a hotel, sporting arena and two grassed ovals. Somerville marks the end of Great Eastern Highway that stretches between Kalgoorlie–Boulder and Perth. Much of the area is now referred to locally as O'Connor. Somerville contains residential area, schools, retail shops, light industry and some horse stables. In the past it also contained market gardens. Stretching from Boundary Street, Kalgoorlie to Holmes Street, Golden Grove and bordering with Central Kalgoorlie, O'Connor and Golden Grove. South Kalgoorlie is mostly residential but also contains the Kalgoorlie–Boulder Racecourse, schools, some light industrial and small businesses. The suburb was expanded in the mid-1990s to include a sub-division named 'Sport of Kings' on Maxwell Street, using a surplus of land from the racecourse. The small existing area features mostly housing with one small primary school. It is also home to the Mount Charlotte mine shaft and Nanny Goat Hill. KCGM, owned by Barrick Gold and Newmont Mining, owner of the Super Pit to the south, has begun mining the Hidden Secret orebody, between 215 metres (705 ft) and 440 metres (1,440 ft) below the surface of Williamstown, using the Mount Charlotte shaft as access. The town is located on the main East-West rail corridor across Australia. The Transwa Prospector operates once to twice daily passenger train services from Kalgoorlie to Perth. The Indian Pacific train also stops here, operating weekly in each direction. Town bus services are provided by TransGoldfields, there are three town routes as well as school services. Transwa also operates road coaches that service the town. Commercial air services connect Kalgoorlie–Boulder with Melbourne and Perth, operating out of the Kalgoorlie-Boulder Airport. Airlines that provide regular flights include Alliance Airlines, Qantas, QantasLink and Virgin Australia. There is a locally owned and operated charter company with a flight school, Goldfields Air Services. Vision Radio Network 1431 AM : Community Narrowcast Station – Christian praise, worship music and talk. The programming schedule is mainly the same as the Seven, Nine and Ten stations in Perth with variations for news bulletins, sport telecasts such as the Australian Football League and National Rugby League, children's and lifestyle programs and infomercials or paid programming. GWN7 maintains a newsroom in the city. The GWN7 bureau provides coverage of the surrounding area for the station's nightly 30-minute news program, GWN7 News, at 5:30pm on weeknights. A Foxtel subscription television service is available via satellite. The local newspaper for the Kalgoorlie–Boulder and Goldfields region is The Kalgoorlie Miner. Kalgoorlie has a semi-arid climate with hot summers and mild winters. The average annual rainfall is 260mm on an average of 68 days and, while the average rainfall is fairly evenly distributed throughout the year, there is considerable variation from year to year. By contrast, winters are cool, with July average maximum and minimum temperatures being 16.5 °C and 4.8 °C, respectively. Cold, wet days with a maximum below 12.0 °C occur about once every winter. The lowest maximum temperature recorded is 7.2 °C on 19 July 1961. Overnight temperatures fall below freezing about four times in a typical winter. Such events occur on clear nights following a day of cold southerly winds. There are 10 primary schools, 4 high schools and 1 university in the Kalgoorlie–Boulder area. John Cornell, actor and movie producer, best known for playing Strop on The Paul Hogan Show. The Super Pit, Australia's largest open-cut gold mine until 2016. The Kalgoorlie Courthouse, previously the Post Office. ^ "2016 Census QuickStats". ABS Census Service. Australian Bureau of Statistics. Retrieved 28 November 2018. ^ "2011 Census Community Profiles: Kalgoorlie – Boulder". ABS Census. Australian Bureau of Statistics. Retrieved 15 September 2016. ^ "3218.0 – Regional Population Growth, Australia, 2014–15: Population Estimates by Significant Urban Area, 2005 to 2015". Australian Bureau of Statistics. Australian Bureau of Statistics. 30 March 2016. Retrieved 12 September 2016. Estimated resident population, 30 June 2015. ^ Raymond Radclyffe, Wealth and Wildcats, Carlisle, Western Australia: Hesperian (1898, reprinted 2004), p.15. ^ "Population of Western Australia". Western Mail. Perth, Western Australia: National Library of Australia. 22 April 1898. p. 23. Retrieved 28 May 2012. ^ "West Australia". Kalgoorlie Western Argus. Western Australia: National Library of Australia. 9 June 1903. p. 32. Retrieved 27 March 2014. ^ "Media Statements - Report into Kalgoorlie-Boulder council amalgamation released". www.mediastatements.wa.gov.au. Retrieved 23 February 2019. ^ "Government to help Kalgoorlie quake victims". ABC News. Australian Broadcasting Corporation. 20 April 2010. Retrieved 22 April 2010. ^ Burke, Louise; O'Connell, Ronan; Pownall, Angela (20 April 2010). "Earthquake strikes Goldfields". Yahoo7. The West Australian. Retrieved 22 April 2010. ^ a b "Man says stolen bike ridden by teen 'veered' in his way before fatal collision". 17 July 2017. ^ Nicolas Perpitch; Courtney Bembridge (1 September 2016). "Elijah Doughty death: Seven people charged in aftermath of the protest". ^ Wahlquist, Calla (21 July 2017). "Elijah Doughty: man who ran over Indigenous teenager jailed for three years". the Guardian. ^ Industry, Kalgoorlie-Boulder Chamber of Commerce &. "Kalgoorlie-Boulder Chamber of Commerce & Industry Inc". www.kalgoorliecci.asn.au. ^ "The Chamber of Minerals and Energy of Western Australia". www.cmewa.com. ^ Kalgoorlie Consolidated Gold Mines (2007). "The Super Pit – Frequently Asked Questions". Archived from the original on 12 March 2008. Retrieved 2 April 2008. ^ ABC, The multicultural faces of Kalgoorlie-Boulder, 5th May, 2014, http://www.abc.net.au/local/stories/2014/05/05/3998198.htm. ^ Web, Design Sense Graphics &. "Artgold Inc". www.artgold.net.au. ^ "Nando's restaurants near Kalgoorlie". ^ "Kalgoorlie Miner" Fire Guts Top Floor of Commercial. 4 November 1978. p1. ^ Kalgoorlie Miner "Famous old Hotel being pulled down". 1 February 1980. p3. ^ Kalgoorlie Miner "Oriental Hotel demolition starts amid protests". 29 June 1972. p1. ^ Greater Perth street directory (54th ed. ), Ausway Digital, 2012, retrieved 26 January 2014 The Melway Perth suburban map has a series of maps at the rear of Kalgoorlie suburbs K1 to K6, Western Australia. Dept. of Land Information (2006), Travellers atlas of Western Australia (9th ed. ), Dept. of Land Information, ISBN 978-1-921048-13-5 the travellers atlas has K2 to K7 – each of these map series are almost identical and show suburb boundaries. ^ "HOMESWEST HOUSING, KALGOORLIE, ANTISOCIAL BEHAVIOUR" (PDF). Government Western Australia. 11 March 2003. Retrieved 14 July 2014. ^ Lucas, Jarrod (16 July 2015). "Super Pit to reveal Hidden Secret". The West Australian. Perth, WA. Retrieved 26 May 2016. ^ "Home". Goldfields Air Services. ^ "College Facilities". Goldfields Baptist College. Retrieved 22 November 2017. ^ a b Lucas, Jarrod (5 May 2018). "Mystery remains unsolved as Victoria Cross hero's family searches for forgotten daughter". ABC News. Retrieved 2 August 2018. ^ a b "KEMP, MR DEAN, RETIREMENT" (PDF). Western Australia Hansard. 23 August 2001. p. 2923. Retrieved 17 February 2008. ^ "Rica Erickson". State Library of Western Australia. 1 September 2001. Retrieved 17 February 2008. ^ "Brian Hayes". BBC Press Office. 1 June 2004. Archived from the original on 24 January 2007. Retrieved 17 February 2008. ^ "Kyle, Sir Wallace Hart". Australian Dictionary of Biography. ^ "Lindrum, Walter Albert (1898–1960)". Australian Dictionary of Biography: Online. Retrieved 17 February 2008. ^ Helen Wolfenden (4 October 2005). "From Kalgoorlie ward to Nobel award". ABC Radio Goldfields Esperance WA. Archived from the original on 10 March 2008. Retrieved 17 February 2008. ^ Trinca, Mathew. "del Piano, James Andrew (Jim) (1916 - 1981)". Australian Dictionary of Biography. Australian National University. Retrieved 1 July 2010. ^ "George Negus Tonight:Tim Rogers". Australian Broadcasting Corporation. Retrieved 17 February 2008. ^ Hunter, Brooke (2 July 2014). "Jenny Talia F.O.C.U.S. Interview". femail.com.au. Archived from the original on 2 July 2014. Retrieved 29 August 2016. ^ "Olympic Landcare Project". Kalgoorlie-Boulder Urban Landcare Group. Archived from the original on 11 March 2008. Retrieved 17 February 2008. ^ "WTF is Kev??". Kevin Bloody Wilson official site. Archived from the original on 29 August 2007. Retrieved 17 February 2008. Casey, Gavin and Mayman, Ted. (1964) The Mile That Midas Touched Rigby, Adelaide..
Wikimedia Commons has media related to Kalgoorlie, Western Australia.